We are considered as the most reliable Manufacturer, Exporter and Supplier of the superior quality Perma Plast PC 201. The Perma Plast PC 201 that we offer is widely appreciated for its excellent performance, utmost strength and high efficiency. The Perma Plast PC 201 is manufactured by using the high-grade raw materials. 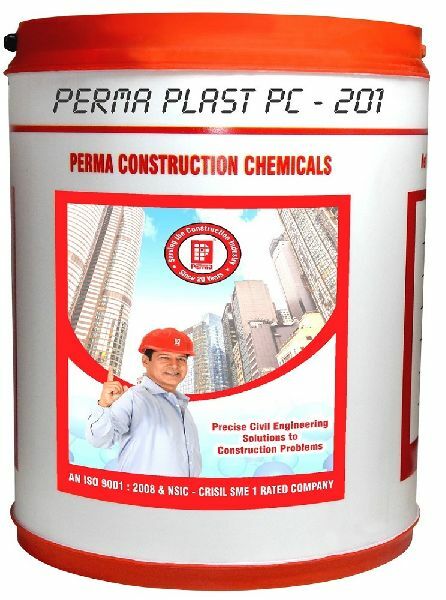 We offer bulk quantities of Perma Plast PC 201 at very affordable prices. To produce self-compacting flowing concrete. To produce high early strength concrete for delayed slump retention & for long over hauls. Increased workability : A concrete with a slump of 50 to 100 mm can be turned into self compacting, flowing concrete that requires little or no vibration, with the simple addition of Perma Plast âï¿½ï¿½ PC 201. High strength mixes : due to reduction in water content higher grade concrete can be product at normal workabilities and cement contents. Improved compaction : concrete can be placed and compacted more quickly and easily when Perma Plast âï¿½ï¿½ PC 201 is incorporated to the mix. Superior finish : surface finish is improved, sand runs and blemishes are reduced. Durable concrete : Enables production of economical, dense and more permeable concrete. Effects of Over-dosage : A severe over dosage of Perma Plast-PC 201 will make the concrete free flowing and may result in bleeding. The strengths obtained however will be in excess of the designed strengths. Packaging : Perma Plast-Pc 201 is available in 30kg. And 250 kgs drum.